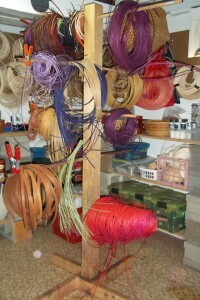 Every weaver who dyes their own reed has their own method; there really are many ways to dye reed. 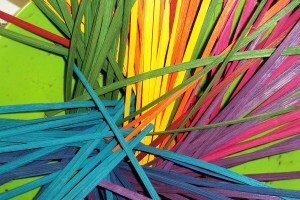 Some ways, of course, are more effective and produce better color and colorfastness. Last time I wrote about dyeing reed, I just talked about the product I use most often, Rit dye. Today I am going to cover dyeing terms, water and the process I use when I dye reed with Rit. Natural Dyes are dyes that come directly from a natural source. There are several ways to extract and use these dyes, some are safe and non toxic, some are just as poisonous and dangerous to work with as chemical dyes. If you are interested in using natural dyes you should invest in a good book about natural dyeing. Direct Dyes are the most commonly used dyes. Reed absorbs a direct dye, so the more dye the reed absorbs, the deeper the color. Using very hot water in your dye bath helps color intensity and colorfastness, using a mordant will help color adhere to the reed. Direct Dyes are not very colorfast, they will fade over time. Rit and Comcraft are direct dyes. Fiber Reactive Dyes cause a chemical reaction between the dye and the reed. Reactive dyes used on reed are formulated for cotton so while they are much more colorfast than direct dyes, light will cause them to fade. Pro-Chemical is a fiber reactive dye. Mordant, also called a fixative, helps the dye adhere to the fiber/reed. Water is the main ingredient of a dyeing vat and plays a major role in dyeing. Since it is full of chemicals, getting the water as neutral as possible will improve your dyeing results. If you are not getting good dye results, use pH test paper and a water-hardness test to check your water. Hard water – add water softener. Alkaline water – add vinegar. Acidic water – add clear ammonia. and chlorinated water should sit over night in an open container so the chlorine can evaporate. Since I use a direct dye, Rit, the amount water is not important, you have enough water if the reed can be submersed in it. The amount of dye, however, is crucial. I use 1 box of Rit per 2# of reed. Heat is an important part of direct dyes. The hotter the dye the more colorfast and the more intense the color. However boiling water can damage the reed fibers. Use high quality reed and don’t let it boil for a long time. I find bringing reed to a boil is okay, but letting it boil makes it very brittle. Because heat is a factor in dyeing, the cooler the water the less dye the reed will absorb. Which means if cool or just warm water is used in the dye vat, the more quickly reed will fade and bleed. It will also be rather pale in color. Sometimes pale or hint of color is the’ look’ you are after, but quickly fading, bleeding reed is always a disappointment. Drying reed in the sun is quick, however it also causes the color to fade very quickly and it drys the reed to the point of being brittle. If you want to dry your reed outside, find a shady spot. Dyeing in the kitchen is bad idea, for lots of reasons, but many of us have probably done it. However, DO NOT use cooking utensils while dyeing. Dye is poisonous. Hanging Rack – whatever works, you can see here the rack I use. Bring a pot of water up to boiling. When the water is boiling, use some of it to mix the dye in a Pyrex bowl. Add it to the vat and mix well. Add the reed and make sure it is submerged. Bring the vat back up to a boil, then either remove the reed or let it set until a shade darker than wanted. After removing the reed from the dye vat, do not rinse. While the reed is hot and steaming, hang it to dry. Keep a fan blowing on the reed and keep a dehumidifier running to help dry the air. Re-position the reed a couple times a day for a few days. When it is completely dry, rinse in ice cold water and then let it dry again. When rinsed the reed should have very little dye run off. For lots of great information look for a copy of “Color Control, Dyeing Reed for Basketry” by BJ Crawford. It’s out of print but you can still find it at some basket suppliers. 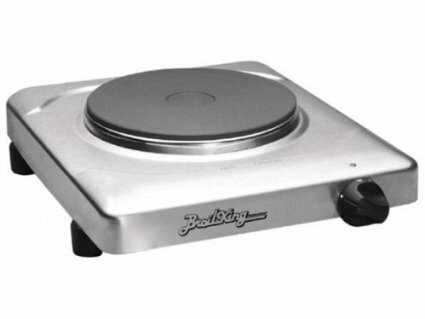 Hotplate – if you are going to invest, buy a good one. I went through three (burned them out!) before I just bite the bullet and bought this one. I often will dye all day long for several days at a time, this restaurant grade hotplate has held up for years. Dye Pot – I dye a lot! and for a while I was going through cheap stainless steel pots too quickly. They would wear out, or warp. However, I have had this one for many years and it still looks new. I LOVE the heavy bottom and the glass lid. Gloves. 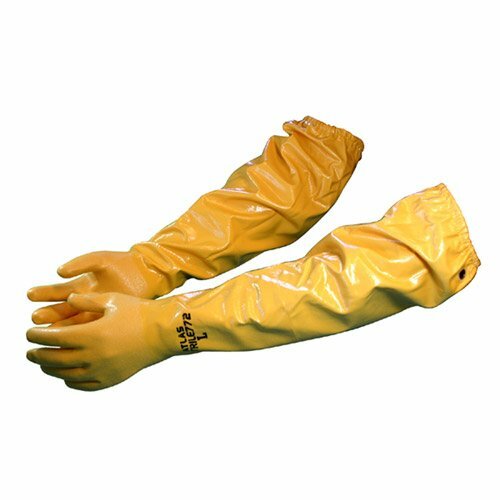 I bought a pair of Wonder Gloves – heavy duty rubber gloves, because I reach into my pot to turn and scoop out the reed You can find them at Royalwood (click here and scroll down). Thanks for allowing us into your world and sharing your dye techniques. Love your colors. Those are gorgeous colors! And thanks for sharing your techniques. I dye using hot tap water in plastic buckets. It works but I have been thinking about upgrading. Beautiful snow up here today! Loving it! Do you dye an entire pound at a time, or do you split it up? I use a big canning pot and while a pound will fit, it doesn’t allow for much room for all the reed to absorb the color. Hi Anne. 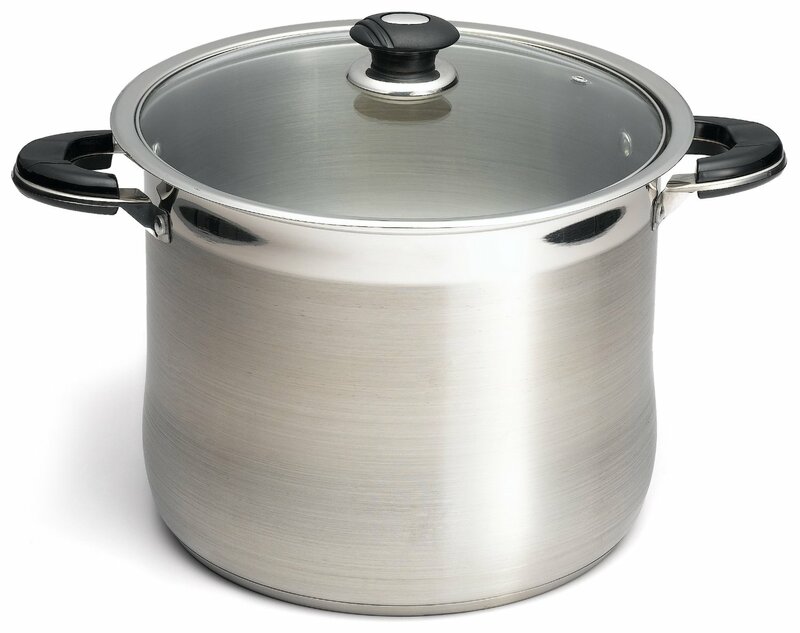 I have a huge stainless steel stock pot and can do three pounds at a time. I open the coil and loosen it up. It doesn’t seem to need a lot of room, just make sure it’s not tightly coiled. Do you use any specific dye to water ratio? How many boxes do you start with and do you add more dye in between batches of reed if the dye is becoming less intense? Sometimes I add additional dye between batches of reed. Sometimes I start over with a whole new dye pot. Depends on the color.